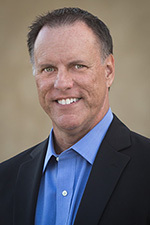 utilization | Richard M. Hicks Consulting, Inc.
UPDATE – March 14, 2016: Microsoft has published official guidance for implementing the changes outlined in this article using PowerShell. Details here. RADIUS and Inbox accounting are the two supported logging options for DirectAccess in Windows Server 2012 R2. When Inbox accounting is selected, a Windows Internal Database (WID) is provisioned. Part of the base operating system, WID is functionally similar to SQL Server Express. Over the last few months I’ve had a few customers reach out to me with a peculiar performance issue. For customers with very busy DirectAccess servers, where those servers have also been configured to use Inbox accounting, they’ve reported observing unusually high CPU utilization on the sqlservr.exe process. As luck would have it, Thomas Vuylsteke, a Microsoft Platforms Premiere Field Engineer (PFE), had already identified the issue and a workaround. 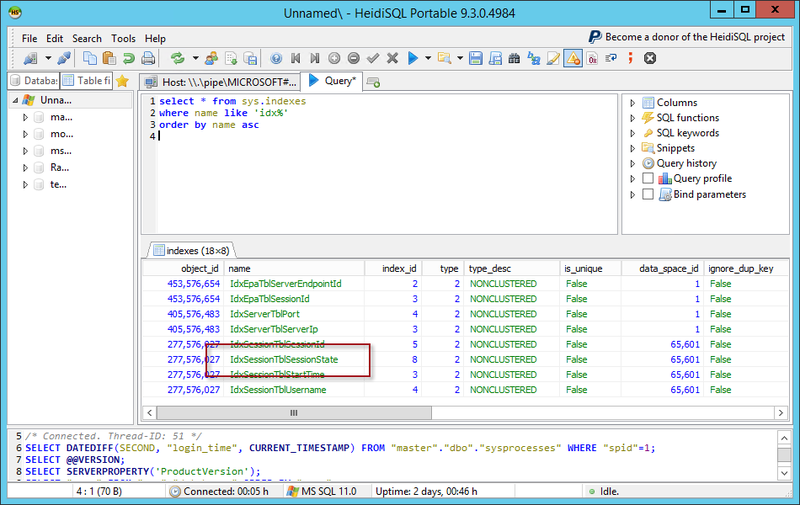 Thomas traced the source of high CPU utilization on the sqlservr.exe process to a missing index on a session state table in the DirectAccess accounting database. If you are interested in learning how he performed the troubleshooting to identify and resolve this problem, you can read his entire blog post here. To resolve this issue, create an index on the Session Table in the DirectAccess database. Changes to WID must be made locally, as it is not remotely manageable. 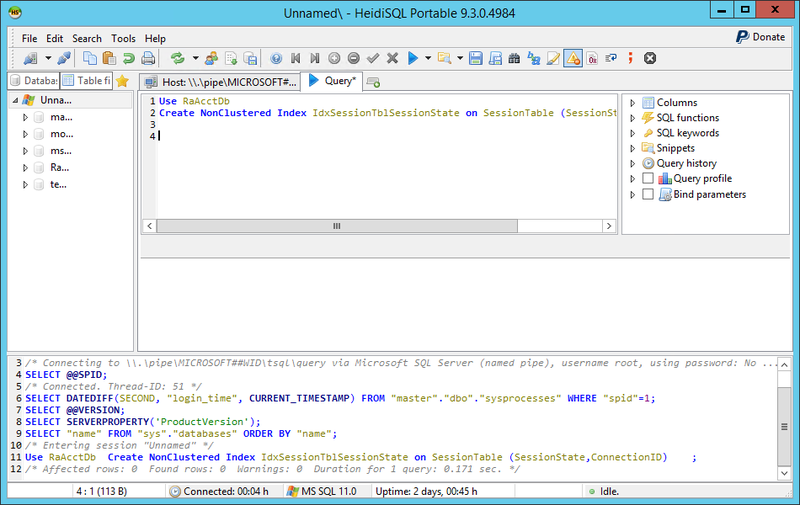 WID does not include a management interface, which means the SQL Server management tools would normally have to be installed. 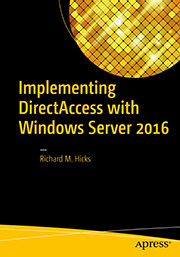 However, I’m not a fan of installing any extraneous software on the DirectAccess server, so thankfully one of the readers of Thomas’ excellent article on this subject, Fredrik Elmqvist, provided a very helpful alternative. Fredrik suggesting using the HeidiSQL tool, for which a fully portable version exists. This allows for changes to be made to the WID database without having to install any additional software. Double-click heideisql.exe to launch the management tool. 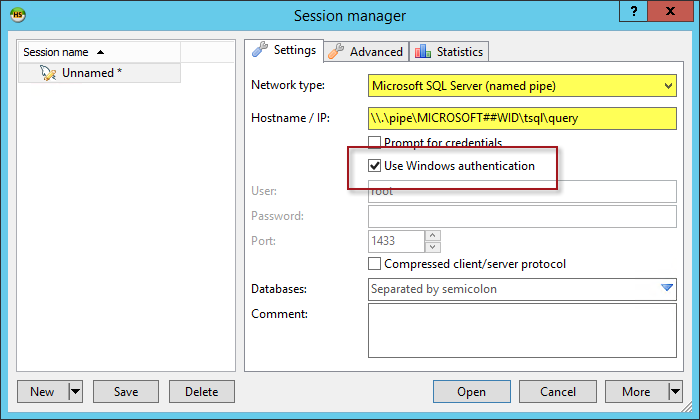 Click on New and then for the Network Type select Microsoft SQL Server (named pipe). For the Hostname / IP: enter \\.\pipe\MICROSOFT##WID\tsql\query. Select the option to Use Windows Authentication. Click the Run icon in the tool bar or press F9. This will execute the code and create the missing index on the Session Table in the DirectAccess database. Once the change has been made, sqlservr.exe CPU utilization should return to normal. 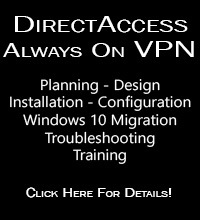 If you have multiple DirectAccess servers configured in a load-balanced array or in a multisite configuration, be sure to repeat these steps on each DirectAccess server in the organization.